Cristiano Ronaldo who started off his football campaign for his new club, Juventus FC today, scored his first goal for the Italian club within 8 minutes.Cristiano Ronaldo made his long-awaited debut for new club Juventus since his £100million move from Real Madrid earlier this summer, against their B team in a friendly at Villar Perosa. Although this is a very useful exercise for all involved the game is about one man. With an emphatic finish after latching onto a ball over the top from Paulo Dybala, the Portuguese gave fans something to remember. However, the game was abandoned after 70 minutes as fans mobbed the pitch to greet their new star. 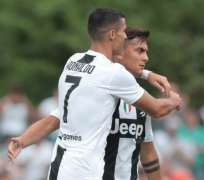 It however ended with a 5-0 win over the club’s B team, in a traditional inter-squad friendly in Villar Perosa on Sunday afternoon.Cristiano Ronaldo’s first goal for Juventus, is coming after he disclosed that it was “an easy decision” to swap life at Real Madrid for that at Juventus, with a €100 million (£89m/$114m) transfer allowing him to fulfil a childhood dream. Having broken countless records over the course of nine years in the Spanish capital, the Portuguese superstar has opted to take on a new challenge this summer. He is 33 years of age, but has shown no sign of slowing down as he chases down a sixth Ballon d’Or crown and another FIFA Best prize. “Great club, first of all it is a great club. Since I was a kid, I looked at this team and said I hope to play there one day. Now I will play for a fantastic club, one of the biggest clubs in the world. I’m happy.